Since entering the food blogging world I've won two great giveaways - salad dressings and cupcakes. (Don't worry, I ate them separately.) I've been paying attention to recipes that I cook, recipes that you cook, and my comments section for a good gift idea. 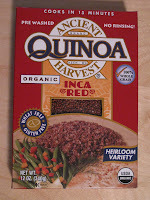 Finally, I decided on Incan red quinoa. All of us seem to be in love with this ingredient and it's allergy friendly. Some of you are unable to find it in your area, and if you are, usually you haven't seen the red version. Here's what you have to do to win! 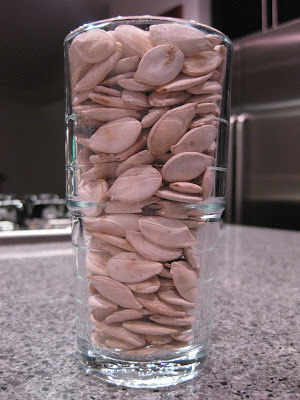 Leave a comment below with your guess as to how many pumpkin seeds are in this glass! The nearest guess, without going over, will win! In the event of a tie, the person who left their comment first will win. Contest will end Sunday, January 11th at 8 p.m. (central time) Please only continental US residents! I'll spread the word tomorrow! I'm going with 100. How nice of you! I looooove that quinoa brand!!! Is the photo thing a joke? Am I a moron for asking? I'm going to guess 110. Christina - so sorry about your Grammy! I am glad you were close with her so you'll have great memories!